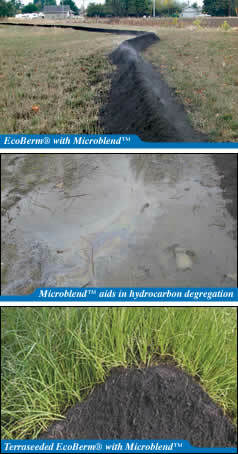  Aid in immediate stabilization of compost/mulch material within the EcoBerm® and EcoBlanket profile.  Enhance the ability of the EcoBerm® and EcoBlanket to bond with the soil surface.  Provide long-term nutrient resources for the proliferation of specific hydrocarbon degrading bacteria found in compost.  Provide long-term nutrient resources for the propagation of structurally enhancing fungi and actinomycetes, and bacteria that excrete soil bonding substances.  Increase the colonization of beneficial fungi within the root zone of a Terraseeded berm to further enhance its filtration capabilities. Microblend is a common component in all EcoBerm® and EcoBlanket construction that helps standardize installation and performance. Microblend has unique characteristics that work directly with the compost materials making it possible to achieve the results that were reported at the San Diego State Universitys Soil Erosion Research Laboratory. With all components of the system combined, we can repeat similar results from one application to the next.